Here's a book on colour mixing by artist Ian Sidaway. It's a 144 page book that has over 10,000 colour mixes for the major media of oil, acrylic, watercolour, gouache, soft pastels, coloured pencils and ink. All the colour mixes are neatly organized in table form and easy to understand. 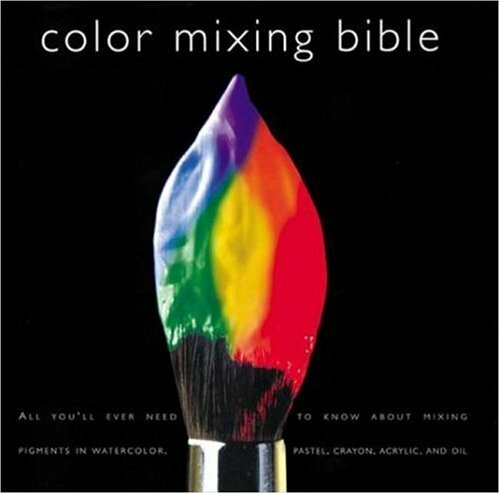 This book would give you an initial idea of what kind of mixes you can get from different colours, or what kind of colours you should pick to achieve the results you want. If you start without a palette, this should save you some money from having to buy colours to test. Making your own colour charts is still recommended though, especially when you already a palette, because colours from different manufacturers might differ. Ian Sidaway also included a good history of pigments and where they come from. It's a useful reference book, more so for those who use multiple media. But it's a starter guide essentially, once you get the hang of colour mixing, you might want to experiment with colours not used in the book.